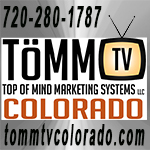 Did you see our article in the January issue of Colorado Serenity Magazine? Our thanks to Cliff Bowron of Branches Cabinetry and Design for offering us his space to share about our mission, accomplishments, and goals, and to the staff at Serenity for putting together a fabulous magazine each month! If you didn't get a chance to read it, it's below in its entirety. Fountains of life. Living here feels like being in paradise every day, doesn’t it? We cherish our pristine natural spaces and have a proud history of preserving and protecting our natural lands. 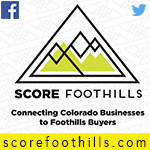 We are enriched having thousands of acres in the Foothills under the stewardship of a multitude of organizations: governmental, private, and nonprofit alike. 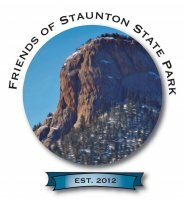 The Friends of Staunton State Park, a 501(c)3 formed in 2012, is newer on the scene in the effort to preserve, promote, and protect some of that very land. 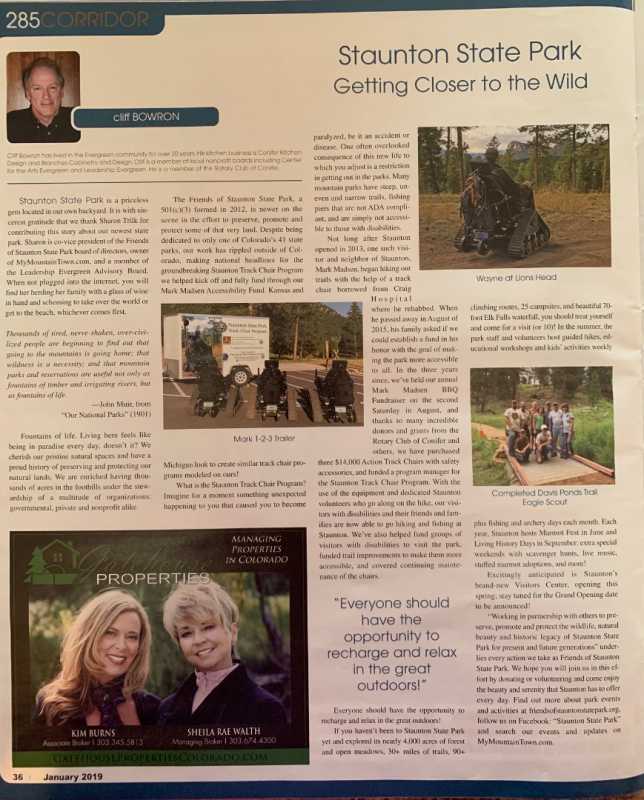 Despite being dedicated to only one of Colorado’s 41 state parks, our work has rippled outside of Colorado, making national headlines for the groundbreaking Staunton Track Chair Program we helped kick off and fully fund through our Mark Madsen Accessibility Fund. Kansas and Michigan look to create similar track chair programs modeled on ours! What is the Staunton Track Chair Program? Imagine for a moment something unexpected happening to you that caused you to become paralyzed, be it an accident or disease. One oft-overlooked consequence of this new life to which you adjust is a restriction in getting out in the parks. Many mountain parks have steep, uneven and narrow trails, fishing piers that are not ADA compliant, and are simply not accessible to those with disabilities. Not long after Staunton opened in 2013, one such visitor and neighbor of Staunton, Mark Madsen, began hiking our trails with the help of a track chair borrowed from Craig Hospital where he rehabbed. When he passed away in August of 2015, his family asked if we could establish a fund in his honor with the goal of making the park more accessible to all. In the 3 years since, we’ve held our Annual Mark Madsen BBQ Fundraiser the second Saturday in August and thanks to many incredible donors and grants from the Rotary Club of Conifer and others, we have purchased three $14,000 Action Trackchairs with safety accessories and funded a program manager for the Staunton Track Chair Program. Through the use of the equipment and dedicated Staunton volunteers who go along on the hike, our visitors with disabilities and their friends and families are now able to go hiking and fishing at Staunton. We’ve also helped fund groups of visitors with disabilities to visit the park, funded trail improvements to make them more accessible, and covered continuing maintenance of the chairs. Everyone should have the opportunity to recharge and relax in the great outdoors! 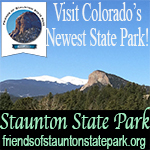 If you haven’t been to Staunton State Park - Colorado Parks and Wildlife yet and explored its nearly 4,000 acres of forest and open meadows, 30+ miles of trails, 90+ climbing routes, 25 campsites, and beautiful 70’ Elk Falls waterfall, you should treat yourself and come for a visit (or ten)! In the summer, the park staff and volunteers host guided hikes, educational workshops, and kids activities weekly plus fishing and archery days each month. Each year Staunton hosts Marmot Fest in June and Living History Days in September: extra special weekends with scavenger hunts, live music, stuffed marmot adoptions, and more! Excitingly, Staunton’s brand new Visitors Center will be opening this spring - stay tuned for the Grand Opening date to be announced! “Working in partnership with others to preserve, promote and protect the wildlife, natural beauty and historic legacy of Staunton State Park for present and future generations”, underlies every action we take; we hope you will join us in this effort by donating or volunteering, and come enjoy the beauty and serenity that Staunton has to offer every day. 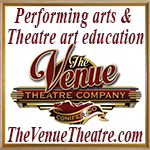 Find out more on our website, by following us on Facebook, and searching our events and updates on MyMountainTown.com.